HMH Books for Young Readers, 9780152066796, 32pp. The captain of this brave and bumbling pirate crew has ordered them to capture the entire alphabet--and they'll walk the plank if they're missing a single letter! Now these swashbuckling mateys are embarking on an alphabet adventure unlike any other, and they won't (ahem, can't) rest until they've found an A, a Z, and everything in between. 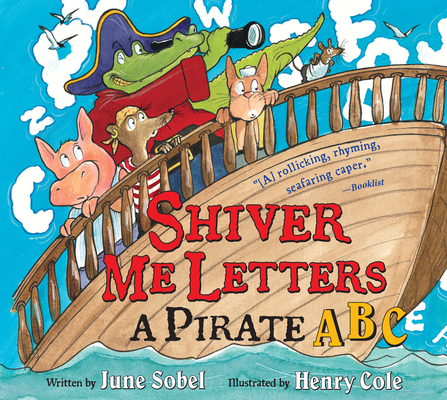 June Sobel's hilarious text and Henry Cole's adventurous animal pirates harmonize in an irresistible book for alphabet-learning, pirate-loving kids everywhere. HENRY COLE is the award-winning illustrator of many books for children, including Mouse Was Mad by Linda Urban, Shiver Me Letters: A Pirate ABC by June Sobel, and The Rubber-Legged Ducky by John G. Keller. He lives in Alexandria, Virginia.